With today’s rapidly changing workplace, emerging technologies and new scientific issues, K–12 educators are challenged to prepare themselves and their students for the future. Since 1994, NCABR’s Rx for Science Literacy workshops have helped more than 4,800 educators from 95 of North Carolina’s 100 counties do just that. At the workshops, educators tour a research facility, hear from scientists about their latest research advances and take home a free curriculum and other bioscience education materials. Each workshop is completely free to attend. You may attend as many workshops as you like. The Rx for Science Literacy series is open to all K–12 science teachers and administrators in North Carolina as well as preservice teachers actively pursuing a degree in education. Rx for Science Literacy is partnering with the National Institute of Environmental Health Sciences (NIEHS) and the National Environmental Education Foundation (NEEF) to present Your Environment, Your Health, a one-day workshop based on the 2010 Deepwater Horizon oil spill. The workshop will explore findings from the NIEHS Gulf Long-term Follow-up Study (GuLF STUDY), which examined the health of workers and volunteers who responded to the 2010 Deepwater Horizon oil spill in the Gulf of Mexico. The GuLF STUDY, sponsored by the National Institutes of Health and led by NIEHS, was designed to find answers to the questions that matter to oil spill response and clean-up workers and affected communities. 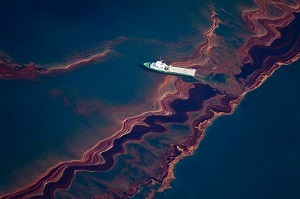 The study examined how different aspects of oil-spill response and clean-up affect current and future health. The study also examined how stress and job loss because of an oil spill can affect health, including mental health. By comparing workers doing specific clean-up jobs to others who did not do those jobs, researchers learned if health problems are occurring at a higher rate than expected among some groups of workers. The findings from this study may influence long-term public health responses in Gulf communities or responses to other oil spills in the future. This engaging and informative workshop will feature hands-on activities, toolkits and resources developed by NIEHS and NEEF, plus a tour of NIEHS. Workshop attendees also will have an opportunity to meet a NEEF representative and to receive information about the NEEF “Hands on the Land” program, which is a national network of field classrooms. Rx for Science Literacy is partnering with Duke University to present a one-day workshop featuring an overview of NCABR’s regenerative medicine curriculum, plus updates from biomedical scientists about the real-world applications of regenerative medicine research underway at Duke University. In this engaging and informative workshop, participants will learn about the critical role that regenerative medicine plays in protecting the health and well-being of North Carolinians and citizens across the globe. Participants also will learn about current research and issues that impact regenerative medicine. Participants will receive a free copy of NCABR’s highly acclaimed Rx for Science Literacy curriculum manual, which contains the featured regenerative medicine curriculum. This workshop is most applicable to high school teachers and those teaching advanced middle school students. Rx for Science Literacy is partnering with the National Institute of Environmental Health Sciences to present Chemicals, the Environment and You. This one-day workshop is based on a curriculum developed by the National Institutes of Health and the National Institute of Environmental Health Sciences. The curriculum focuses on the science of toxicology to help students understand the relationship between chemicals in the environment and human health. It also conveys the influence of chemicals on the health of living organisms. Participants will receive a free electronic copy of the curriculum. Participants will receive a free copy of the curriculum. Rx for Science Literacy is partnering with Duke University to present Evolution & Medicine. This one-day workshop is based on an NIH curriculum that allows students to explore evolutionary principles and learn how evolution informs human health, biomedical problems and disease treatment. Rx for Science Literacy is partnering with the Wake Forest School of Medicine’s Clinical and Translational Science Institute (CTSI), Center for Vaccines at the Extremes of Aging (CVEA), Brenner Children’s Hospital and its Sticht Center on Aging to present The Importance of Vaccines: Research Tells the Story, a one-day workshop that will be held Tuesday, July 24, from 8:00 am – 4:00 pm at the Biotech Place in Winston-Salem. This workshop will feature an overview of NCABR’s vaccine curriculum plus updates from biomedical scientists about the real-world applications of vaccine research underway at the Wake Forest School of Medicine. In this engaging and informative workshop, participants will learn about the critical role that vaccines play in protecting the health and well-being of North Carolinians and citizens across the globe. Participants also will learn about current research and issues that impact vaccine development and distribution. 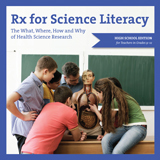 Participants will receive a free copy of NCABR’s highly acclaimed Rx for Science Literacy curriculum manual, which contains the featured vaccine curriculum. If you need to cancel your registration, you must notify Allender Lynch at the email address below at least 24 hours before the start of the workshop. Failure to cancel in accordance with this policy will result in a $50 charge to your school/employer.